You are currently browsing the tag archive for the ‘Rum’ tag. See my recipe featured in Readers’ Recipes: The New York Times Magazine. I’ll never forget the first bing cherry I ate. In 1992, after moving from Oklahoma to California, I attended a cookout with friends from my new high school. Along with the garden burgers and hot dogs was a bag of fresh cherries. I found it odd to see cherries eaten out of a produce bag, not immersed in syrup. Always the adventurous eater, I tried a fresh cherry and immediately fell in love with the intricate flavors that barely resembled the sticky sweet cherries of my youth. Every summer since I’ve anticipated their seasonal purchase and consumption. 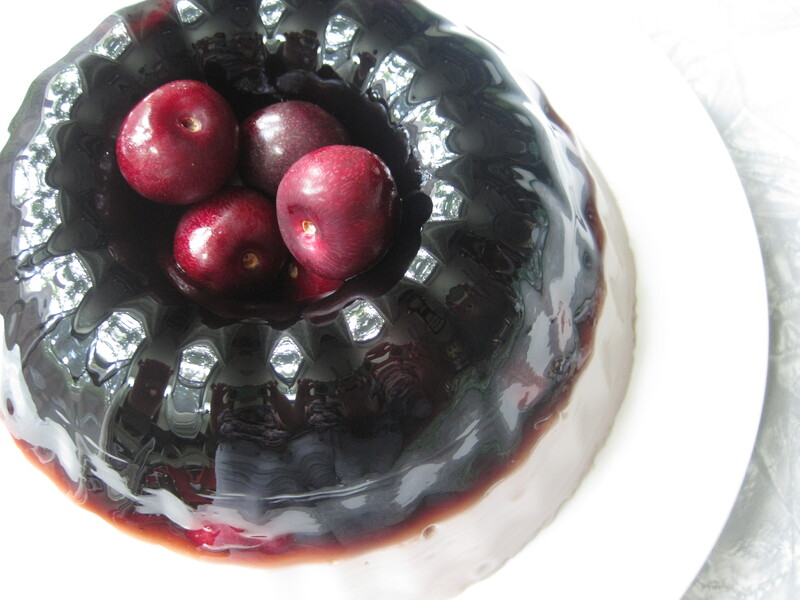 This gelatin consists of cherry juice, cherries, and rum on top; sweetened condensed milk, almond extract, and cherry juice on bottom. The cherry/almond/rum combination is sweet and lovely. See this mold mentioned here in The Globe and Mail, and here at Apartment Therapy The Kitchn. I love figs and I love cardamon, but I never thought of combining them until I read this fantastic article about simple syrups by Addie Broyles in the Austin American Statesmen. 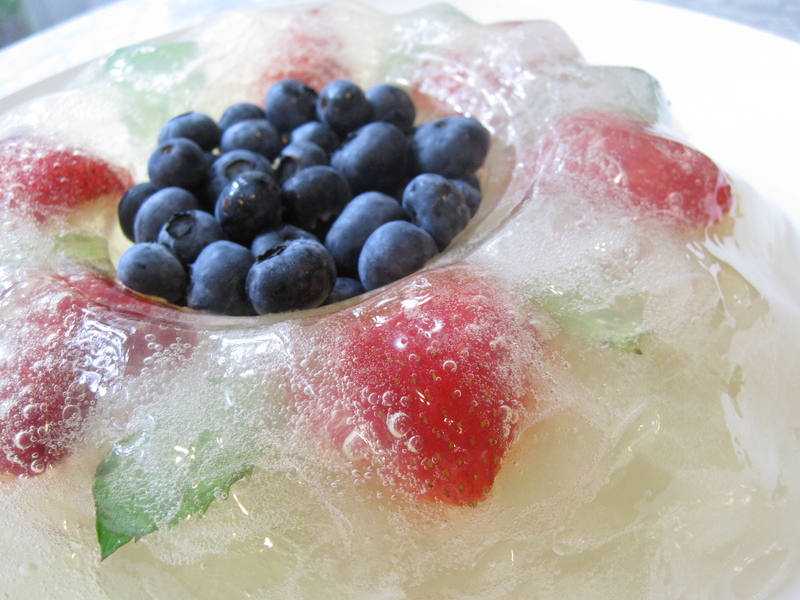 The article describes perking up summer drinks with simple syrups, but I immediately transferred the concept to gelatin molds. 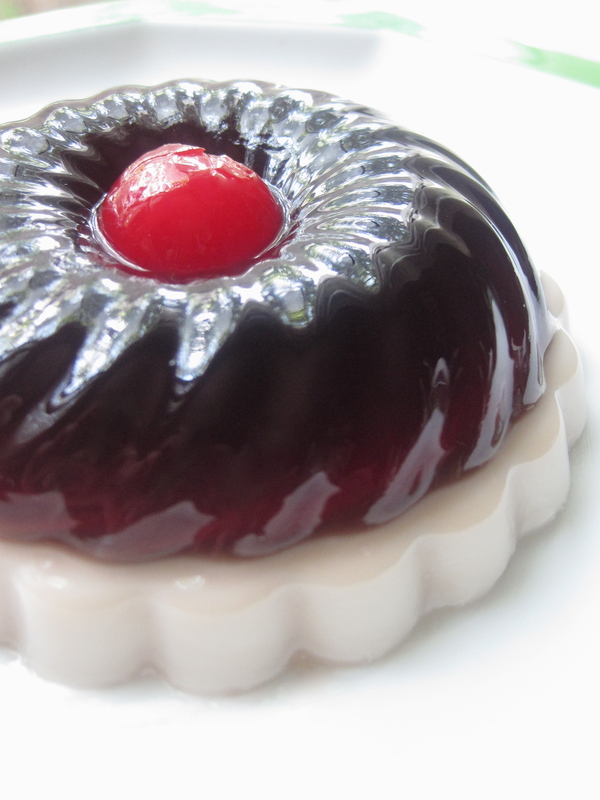 This mold was made with sweetened condensed milk, rum, and fig and cardamom syrup. Fruity, spicy, and boozy – this may be my favorite gelatinous experiment to date. 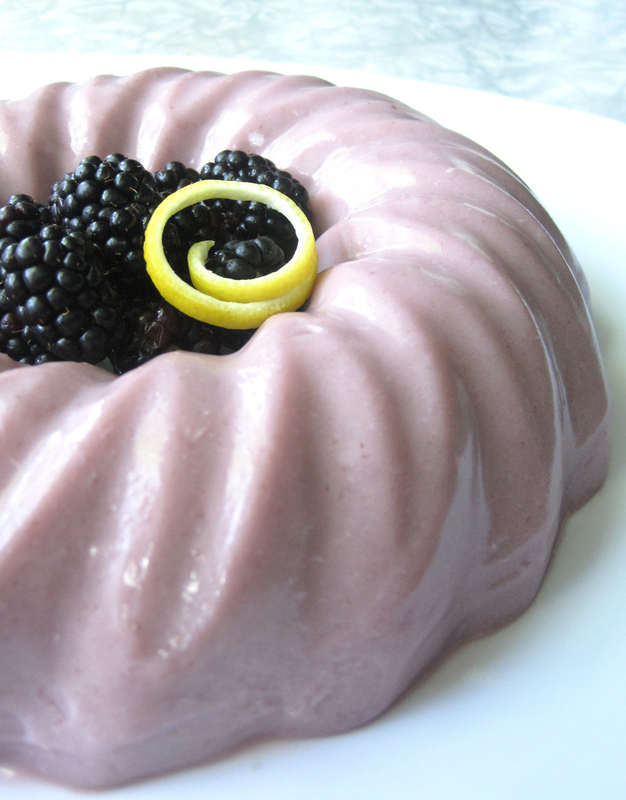 My friends enjoyed pouring additional fig and cardamom syrup on the creamy mold – yum! We also enjoyed eating the cardamom and sugar soaked figs. 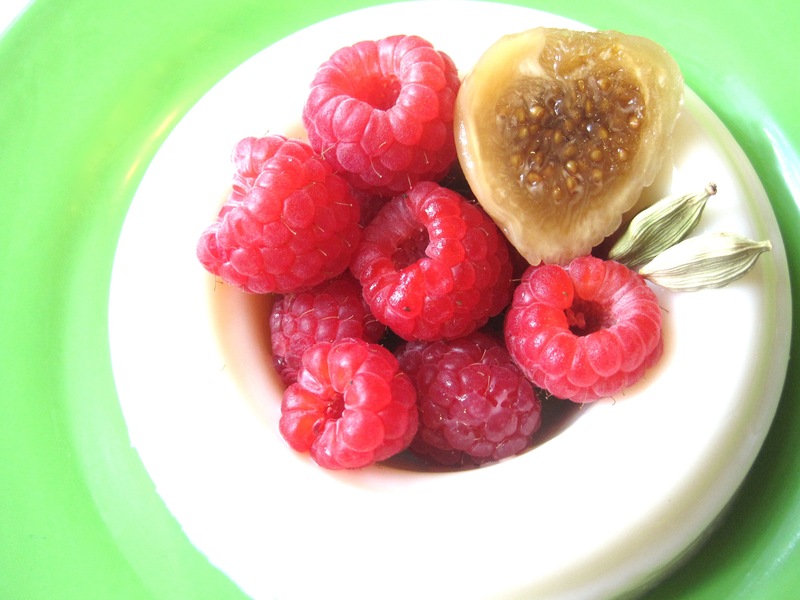 To make a fig and cardamom simple syrup, combine 1-cup water with 1-cup sugar in a saucepan and bring to a low boil. 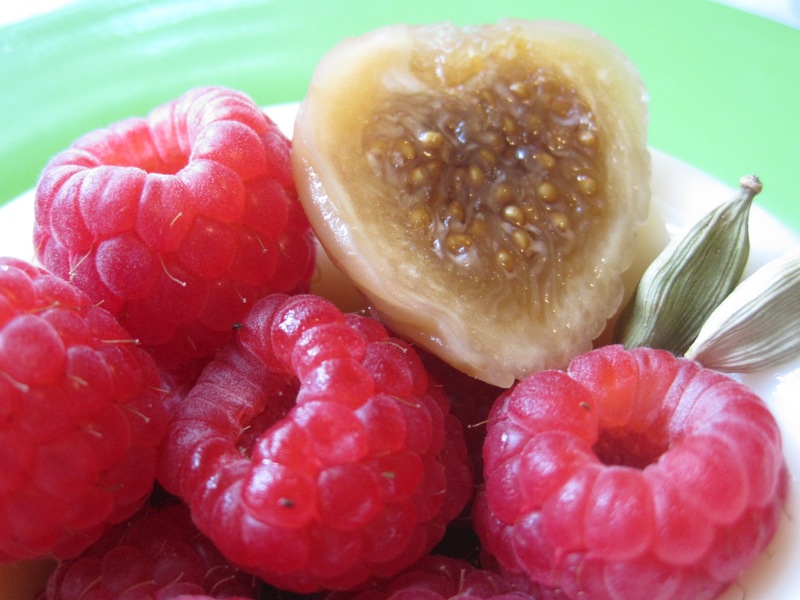 When the sugar is dissolved, remove from heat and add 1-cup dried figs and 2-Tbsp. whole cardamom pods. Cover pan and let sit overnight. In the morning strain the syrup and store in an air-tight container in the refrigerator. Sprinkle two packets of gelatin on top of ½ cup water. Set aside for 5 minutes. In a small saucepan heat up rum and the previously prepared fig and cardamom syrup, but do not boil. Once heated, pour over the bloomed gelatin. Stir until gelatin dissolves. Stir in sweetened condensed milk, and then spoon into mold(s). Refrigerate until set, at least 4 hours. The mojito is one of my favorite summer drinks. 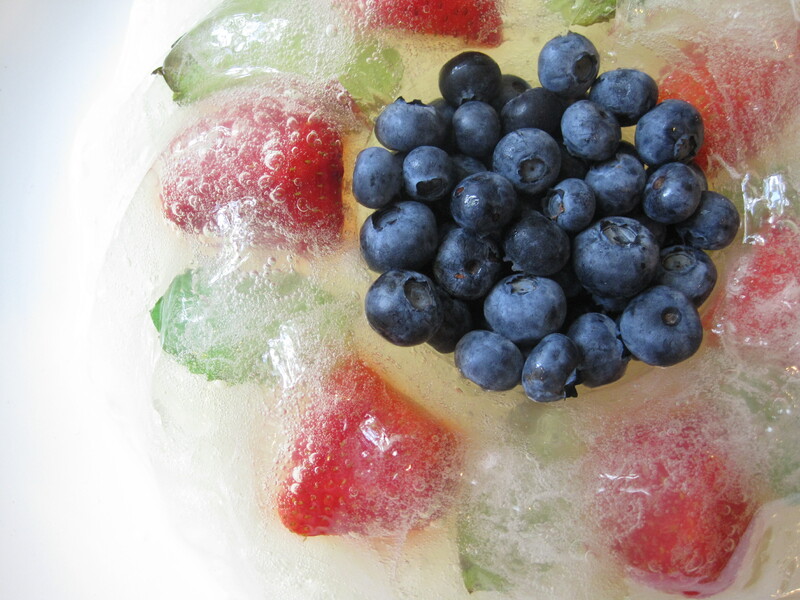 Sweet, sour, minty, and bubbly. Here I suspended strawberries and mint leaves for visual interest, and added blueberries to create a patriotic theme for 4th of July. Making cocktail-based molds from scratch is a challenge! I finally decided to steep lime zest and mint leaves in a hot lime syrup (water, limes, sugar). The lime/mint combination tasted great, but I was heavy handed on the rum. Even my alcohol loving friends admitted it was strong. A bit more practice and I’ll hopefully unlock the secret to cocktail-based gelatin molds.